Imagine a man toasts TOAST in the French colours. The word in French for toast is the regular ER verb toaster. To remember this, imagine a man TOASTS slices of TOAST in the French colours. The French colours red, white and blue remind you that the word is similar to (and borrowed from) English. The man in the cartoon reminds you that the word is masculine. Masculine word = male character. Le toast beurré = buttered toast. Cartoon Memory Triggers will help you to toast French words into your memory, and help them to pop out when you need them. toast! toaste ! toastons ! toastez ! ⇒Toaster is a regular ER verb conjugated in like 5000 others. These are the most common verbs in French. ⇒Learn toaster and it will reinforce the pattern for ALL those other ER verbs. ⇒ You can more easily remember words and verbs like the French verb toaster - French for toast - using the techniques of the world's Memory Masters. 200 Words a Day! 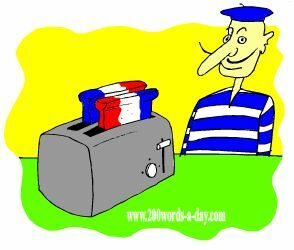 Free Daily French Lesson Online - the verb in French verb toaster - fully conjugated. French Learning Made Fun and Fast with your free Daily French Verb Lesson - toaster.